The firm vented its frustration in its results press release: “The bubble days of 2007-08 had blurred the distinction between the real and the fanciful in the Indian mobile sector. The resultant overcapacity has manifested in tariffs unrelated to economics. Market prices have plumbed depths which predicate that the market itself will eventually work the overcapacity out of the sector." It may be a while before the overcapacity problem is taken care of, since new entrants are still in the process of rolling out their services. The interim period is likely to be rather painful, as Idea’s results for the September quarter show. As a result, average minutes of usage by Idea’s customers fell by 6% quarter-on-quarter. And price competition led to a 3.5% drop in average revenue per minute (ARPM) realized from customers. The cumulative effect of this was a 9.9% drop in average revenue per user (Arpu), which completely negated the smart growth in subscriber base. 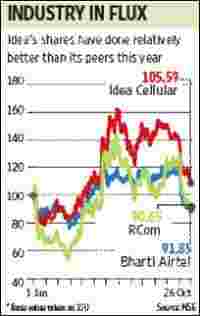 Such was the impact of increasing competition that revenues and profit in Idea’s 11 established circles fell sequentially. It was only because of a growth in new circles that company-wide revenues were flat. Things are only expected to get worse since the full impact of the latest price cuts by the industry is yet to show. After Reliance cut tariffs to Re0.50 recently, the industry has responded by lowering tariffs, and this is expected to result in a sharp drop in ARPM in coming quarters. According to a recent report by Anand Rathi Financial Services Ltd, ARPM is expected to fall to about Re0.46-0.47, which is 16-18% lower compared with what Idea reported for the September quarter. Another indication that the industry is in a state of flux is Idea’s decision to lower its capital expenditure plans again to Rs4,500 crore. It had stated at the beginning of the year that it would spend Rs6,000 crore, which had been lowered to Rs5,500 crore three months ago. With the company taking an increasing amount of caution as far as its investments go, it’s not surprising that Idea’s investors too have been turning cautious on the stock. The company’s shares have fallen 35% from its highs in mid-June, but have still done better than competitors Bharti Airtel Ltd and Reliance Communications Ltd this year. After its dull financial performance in the September quarter, there may be some room for underperformance.